We have been toying around with the idea of the perfect chili for a while now. Of course, depending on your location and heritage, there are a thousand different variations on a classic. Beans or no beans? Pork or beef? Do you use a whole muscle or ground meat? What cut? And then, what kind of chiles do you use? Researching a "classic" chili doesn't answer many questions as much as it just asks more. And so we stewed (get it!?) on these questions happily, experimenting and tasting along the way. It's a hard job, but someone has to do it. 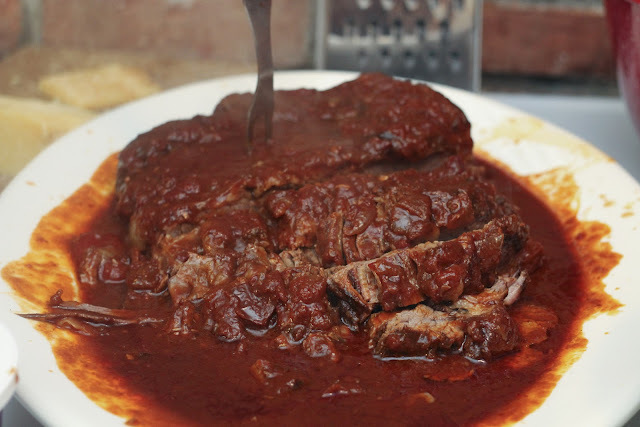 At long last, we decided: beans on the side; beef; whole muscle; brisket, ancho and chipotle chilies. And since the only thing more American than apple pie is chili, we debuted our well-tested recipe on election day for a group of hungry and anxious friends. As he was closing up shop Monday night, Jake grabbed a gorgeous and fatty Whippoorwill brisket, along with some Cayuga black turtle beans, Wild Hive cornmeal, two quarts of beef stock, and a few ancho and chipotle chili peppers. On Tuesday afternoon, he put the brisket in the oven, the beans on the stove top, and let everything simmer away. Meanwhile, Silka made some skillet cornbread to soak up the smokey, spicy sauce. In the end we couldn't have been happier with the results... ALL of them. Bring the brisket out of the fridge at least one hour prior to cooking so it comes to room temperature. At the same time, soak the dried chilies in hot water for about ½ hour. 1. Pat the brisket dry and coat with salt. (We used smoked salt - if you can find it, we recommend it!). Preheat the oven to 250. 2. 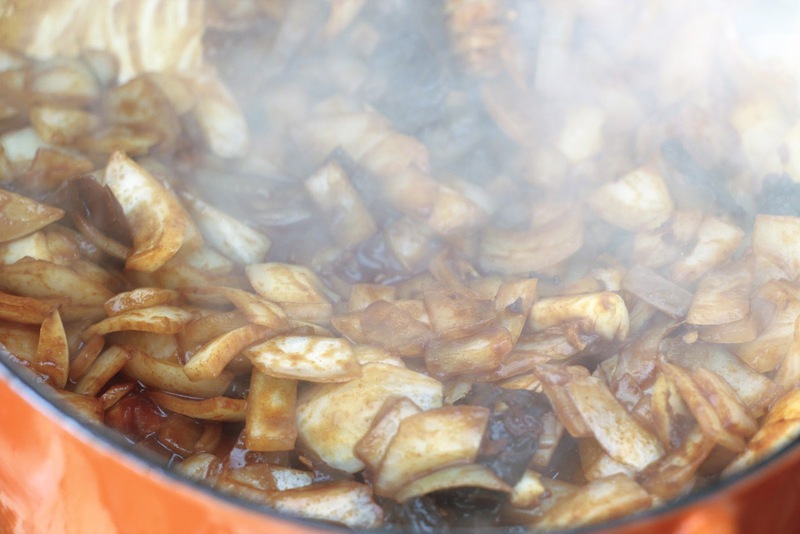 Heat the lard in a large dutch oven over high heat. 3. When the lard starts to smoke, brown the brisket for 3 minutes on each side. Set brisket aside. 4. Add the onion and garlic to the pan, cooking until softened. 5. Add the paprika, cumin, sugar, tomato paste and chillies, cooking for an additional minute. 5. 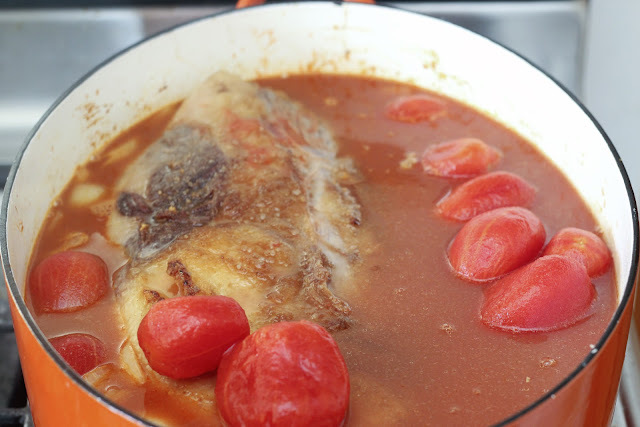 Return the brisket to the pan along with tomatoes and stock. Bring to a boil and cover. 6. Place in the oven for 6 hours, removing the lid for the final 1 ½ hours of cooking. 7. After you have removed the the brisket from the oven, take the brisket out of its sauce, place in a deep dish and let rest. 8. With an immersion blender, or in a food processor or blender, puree the sauce remaining in the dutch over and reduce for about ½ hour. 9. 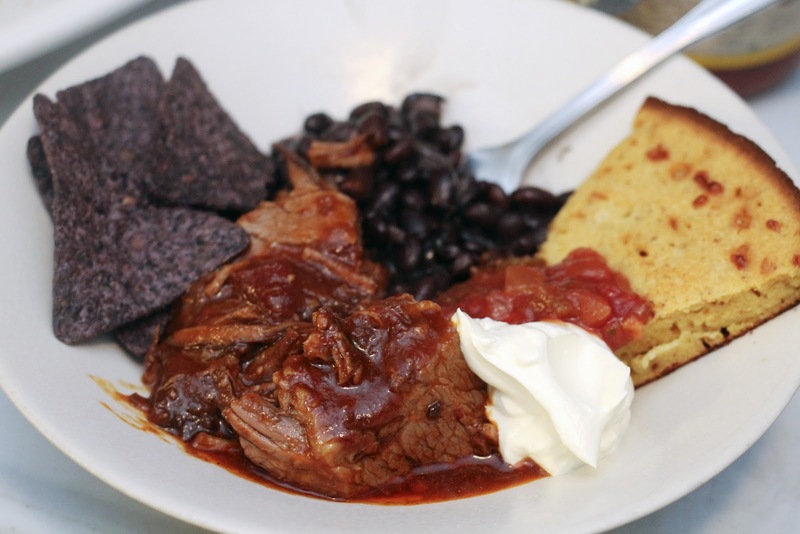 Serve brisket with the chili sauce poured on top, beans and cornbread on the side. What a gorgeous, drool worthy, plate of food! The color of the sauce is incredible.